Multichannel and single-channel detection of photoinduced optical density changes (DOD). 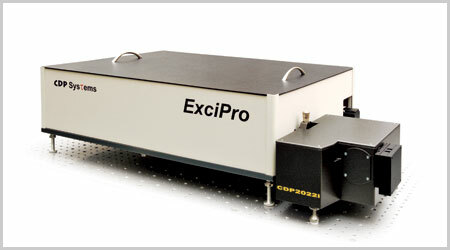 ExciPro is the first on the market professional system for time-resolved ultrafast transient absorption pump-probe spectroscopy. Two linear image sensors are placed in the focal plane of an imaging spectrometer to measure probe and reference spectra, and the reference channel is used in transient absorption or photometric measurements to get best signal-to-noise ratio. CDP Systems Corp. has been manufacturing femtosecond pump-probe spectrometers since 2000, and we satisfy customer’s requirements introducing a wide range of ExciPro configurations and options. Copyright © 2003-2019 CDP Corp.